In this country, approximately 13 percent of youth live with a serious mental illness, but only about 20 percent of them get the help they need. While primary care providers are often positioned to assess a child’s behavioral problems early on, many feel ill-equipped to make the right referrals, prescribe medications, or manage a chronic condition. To give District pediatricians the resources they need, Children’s National worked with other area intuitions to establish the DC Collaborative for Mental Health in Pediatric Primary Care. Recognizing that only 35 percent of District pediatricians had a current listing of mental health providers, the collaborative’s first undertaking was to develop and distribute a printed directory of providers to streamline referrals. The hard-copy guide then evolved into DC MAP, a phone consultation and referral service that helps pediatricians choose the best course of action on specific cases. And, in the fall of 2015, those resources were made available online at DCHealthCheck.net. To guide future efforts, the partners formed a working group charged with planning, implementing, and evaluating new initiatives, as well as a community advisory board to provide strategic direction and feedback. Staffed by a dedicated team of psychiatrists, psychologists, social workers and care coordinators. DC Mental Health Access in Primary Care (DC MAP) offers free mental health consultation services to local primary care providers. Physicians can learn more about DC MAP, enroll in the program, or request a consultation, via DCMAP.org or 1-844-30-DCMAP. The Early Childhood Innovation Network (ECIN) is a local collaborative of health and education providers, community organizations, researchers and advocates promoting resilience in families and children from pregnancy through age 5 in Washington, D.C. During this critical period of brain development, children are deeply affected by their experiences and environment. ECIN’s approach affirms the tremendous opportunity to promote and ensure healthy development of young children. Visit ECIN.org or contact ECIN at info@ecin.org to learn more. Website visitors can meet ECIN’s team and funders, learn about ECIN’s innovations in Washington, D.C., and discover helpful resources. The Collaborative has also developed a resource guide to support parents, families, and guardians. The Child & Adolescent Mental Health Resource Guide gives DC’s pediatric primary care providers a directory of mental behavioral health resources. The Children’s Hospital Foundation is the fundraising arm for Children’s National Health System. 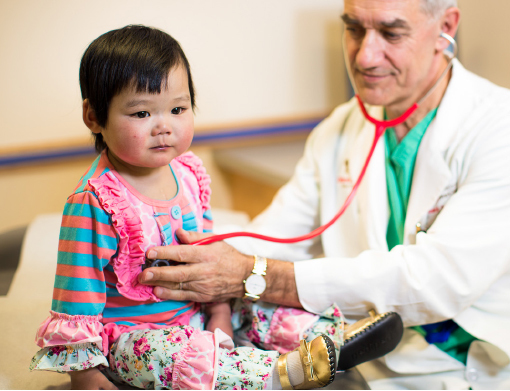 We support doctors, nurses, clinicians, and staff who are advancing pediatric medicine through expertise, innovation, and excellence in care and research. Marcee White, MD, is featured in an NBC4 story highlighting the mobile health unit services. Pediatrician Dr. Linda Fu discusses the importance of vaccinating your children. On Wednesday, Safe Kids DC, Children’s National Health System, and other community organizations joined with FedEx volunteers at John H. Ketcham Elementary School in Southeast Washington, DC, to raise awareness about pedestrian safety on International Walk to School Day.